Perfectly sized for king size beds, this luxurious Duck Feather Down Bolster Pillows provides plush comfort and support ideally suited for side sleepers. 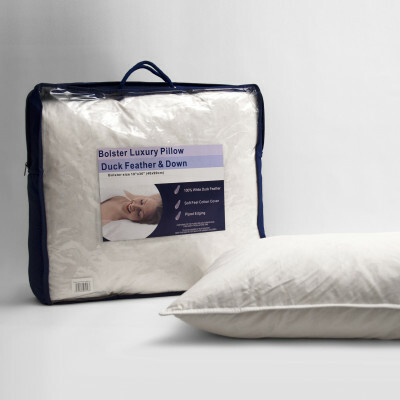 Cased with a premium 230 thread count cotton cover for absolute softness and filled with 90% White Duck Feather 10% White Duck Down, this bolster pillow is extremely soft and durable enough to bestow you with high comfort and peaceful sleep. Machine washable at 40°C for an easy way to keep it fresh and clean, this bolster pillow is easy to maintain and can be tumble dry also. Available in 19" x 54" Bolster Pillow (4ft6inch), 19" x 60" Bolster Pillow (5ft), 19" x 72" Bolster Pillow (6ft). Sizes available: 19" x 60" Bolster Pillow (5ft), 19" x 72" Bolster Pillow (6ft).